Thanks, Jael! We still have a lot of snow to play in, but I think a spring thaw is on its way. Zhoug is a wonderful daily condiment - so glad you love it, too. This looks so good, Hannah. I think I have to make some! I love all of those fresh ingredients! What a cute doggie! Thanks, Amanda! I think you'd really enjoy zhoug. Its fresh flavor really pops and it keeps well in the fridge, so it's nice to have on hand. I just picked up some more steaks so this combination will be on our table again this week. I have never heard of zhoug Hannah but now I feel like life wont' be the same without it...every ingredient is on my favorites list! I've been sick so eating a lot of soups and cereal and now I am craving a big old steak with zhoug...maybe it means I'm finally on the mend huh? Barb - I'm piping in on Hannah's comments but if you have just a bit of mending left to go - zhoug will get you over the hump - spicy and full of herby goodness. It's our February Tasting Jerusalem ingredient and with your creativity, you'll find so many different uses for it. Give it a try - you'll love it. Zhoug is new to me and is so appealing! The robust, straightforward flavors are something I always crave. I big fat salad with grilled flank steak is on the menu for this Friday, so I have enough time to gather ingredients and add Zhoug! Deb, I do hope you enjoyed your steak dinner and liked the zhoug! I'm sure the salad you prepared was gorgeous. Zhoug really is a robust condiment and lovely pantry staple. I can't believe I have never heard of or made this - although I am convinced I have eaten it and just not realized it. 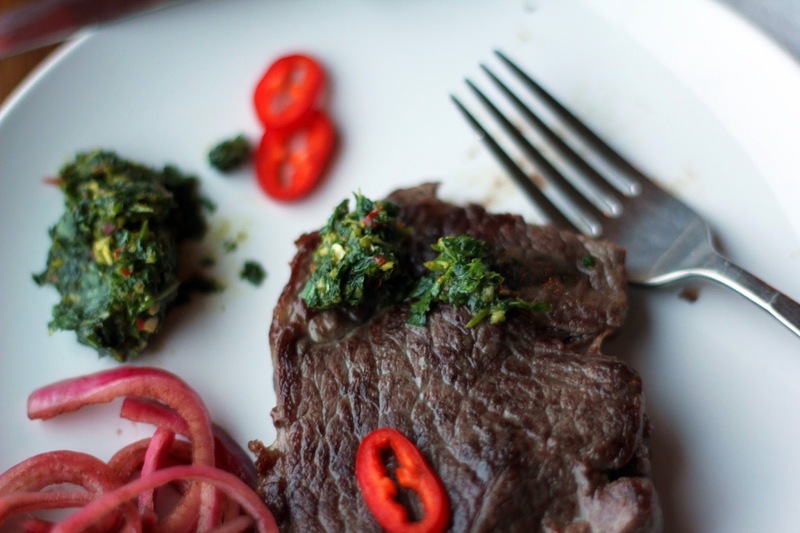 Such a great pairing with steak - totally making this next time we have steak Hannah! 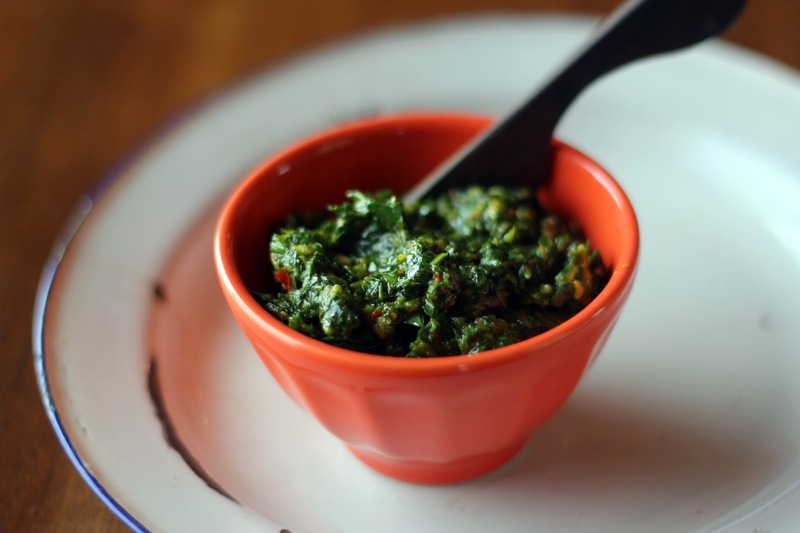 This is such a great idea - I think when I was writing the zhoug monthly post I came across the analogy with chimichurri - very astute of you. I am going to have to give the steak technique a try and pairing it up with zhoug. Thanks for your always creative contributions to our group Hannah! Thank you so much, Beth! I appreciate your sweet words. As always, I'm happy to be part of TJ, and this month especially glad to feature zhoug. Let me know what you think of the steak technique - we've enjoyed consistently good steaks since discovering it. I love condiments, they add zing and bring life to an otherwise ordinary meal. I have to make this, love that it's so versatile. 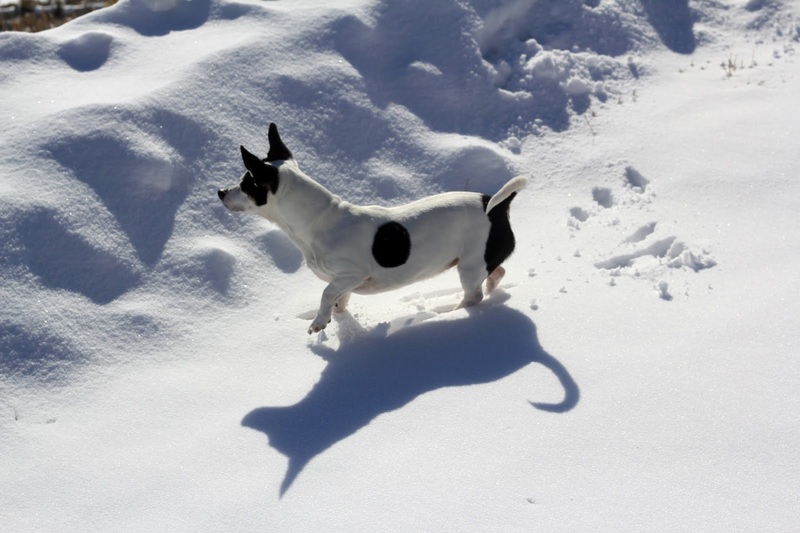 Your cute little pup in the snow is adorable! Thanks so much, Suzanne! I couldn't agree more - condiments add lots of zing and life. I really think they can be the foundation of a terrific meal. I hope you enjoy the zhoug! Mmmm, this looks so good! I've never thought to combine steak and zhoug, but what a tremendous idea! That's really inspired, and I'll bet the flavor combo is wonderful. So nice -- thanks. 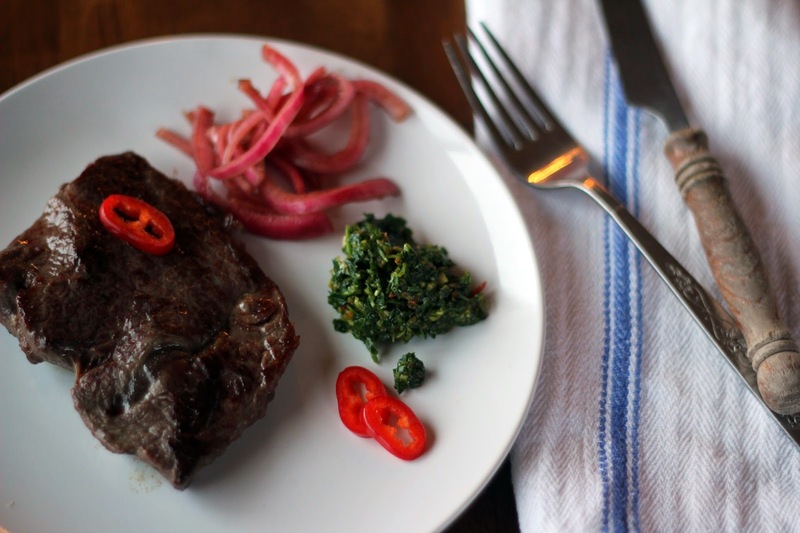 I had a flank steak with chimichurri once and loved the combination of rich meat and bright herbs. I would definitely be into zhoug! Steaks should totally be finished in the oven...our kitchen always fills with smoke whenever we've tried to pan fry them and we end up eating way later than we wanted into and in a much worse mood than we'd like. Great tip, Hannah! I've never thought to have zhoug with my steak and I love the little red bowl you presented it in. Yours looks a little darker than my version but the ingredients are pretty similar. I'll be grilling up some steaks to try this combo. Thanks for the idea. My pleasure, Yosef! I hope you enjoy the steak and zhoug together. I like your version of zhoug, too, and will try it next. Your addition of cumin seeds sounds wonderful! We just finished off a batch of zhoug by slathering it on boneless chicken thighs and grilling them. Very tasty!